Through out the years I have had the pleasure of getting to know hundreds of dogs. They all leave their paw prints on my heart and fill my life with an untouchable joy. Grooming is definitely hard work and there are days that are extremely stressful, but it is work that I love doing because honestly, dogs know happiness like no other creature I have ever met. There are days when I might be sad and days when I’m tired, but dogs lift me up and carry me through those days, which is something that I will always treasure and hold on to for as long as I live. They know unconditional love and bring it to me every day. I feel extremely lucky that I get to be reminded of the presence of that kind of love all the time. Love and tolerance comes to them naturally more times than not and they share that with me and teach me what those words truly mean. From start to finish, all of the groomers are grooming day in and day out and all of the bathers bathing, and then there’s the cleaning and disinfecting, and all the potty breaks. Can’t ever forget the potty breaks! The phone is constantly ringing and the doorbell is usually simultaneously chiming as customers come and go. A few dogs are always barking with impatience, but most are usually zonked out and sleeping. The choreographed chaos that is a groomer’s life is undoubtedly in full effect as soon as that first customer walks through the threshold of the front door each morning. This particular day was well under way when I decided to look over at the table next to me. 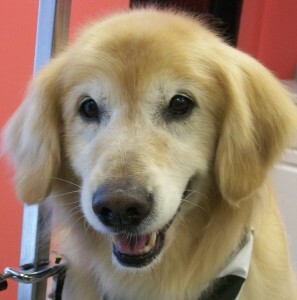 There was Indy, a robust and beautiful Golden Retriever. He was just as happy as could be, his tail was wagging at full throttle and a big cheesy grin on his face lit up the whole room. He knew what happiness was and he shared it with everyone. The moment he realized I was looking at him he got so excited and full of those uncontrollable doggy jiggles that the groomer working on him had to stop and laugh while keeping him contained on the table. I looked at his face and into his eyes and felt all of the warmth and love that only dogs can give. I smiled as I thought about his fancy Louis Vuitton collar and the story about how he had once met Janet Jackson (who I’m told ooed and aahhed over him) on a beach somewhere in California. I thought about how he smiles like Elvis when you pet him just right on his mouth and that his favorite trick is flipping a treat off of his nose into the air and then catching it with a quick snap of his mouth. At second glance, I couldn’t help but notice how white his face had gotten over the years since I’d first met him and how his eyes had gotten a little bit cloudy. 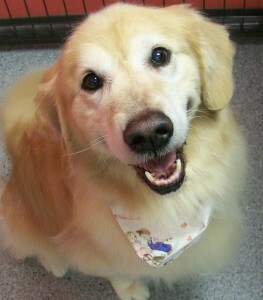 He had a few extra lumps and bumps that come with old age that I could feel as I loved on him. Just as I was starting to get sad about all these things, a big slobbery kiss took up the entire right side of my face and I couldn’t help but laugh hysterically. I was reminded just exactly how lucky I am to do what I do and I felt so grateful to have Indy and the countless other dogs in my life each with their own story and all so full of love that they share with me every single day. Gratitude is an action word I have learned over the years. The more you put into something the more you get out of it, the more grateful you become. Getting caught up in the whirlwind of life is virtually impossible when you work with dogs. It truly is comforting and gratifying that I am reminded every day to take time to slow down and be present. Thanks be to the ever loving heart of a dog! This entry was posted in Kathie's Blog on April 7, 2016 by Kathie. I will not sell “rawhide”. Just because a dog will eat something does not mean it should! Folks, I really don’t know anything else! ©2005-2019 Platinum Paws. Design by Netta Radice Design.